"West End parents Brandon and Jackie Smith told WRIC that they discovered the offensive eggs while having an Easter Egg hunt with their 3-year-old son on Sunday afternoon. "The notes pointed to the websites WhiteManMarch.com and WhiteGenocideProject.com, a reference to a so-called 'worldwide' protest in March that reportedly ended with a very small turnout. "The Southern Poverty Law Center's David Neiwert pointed out that the idea for putting racist messages in Easter eggs originated with White Man's March founder Kyle Hunt, who insisted that he was not targeting children." 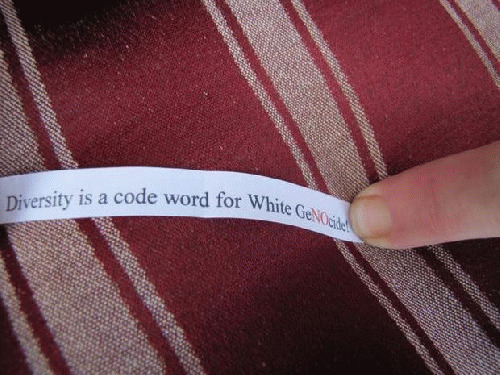 "Easter eggs were delivered early for a number of Oakdale residents, but instead of candy, the recipients found white supremacy propaganda. "The message in her egg was not only racist but a bit perplexing: 'Asia for Asians, Africa for Africans and white countries for everybody!!!' Wolford, who referred to the eggs as 'hate bombs,' surveyed her neighborhood in The Vineyards subdivision and found at least 15 more eggs after discovering hers on her welcome mat. "Along with the passages, the eggs contained a Web address for the people apparently responsible, organizers of the White Man March. The organizer, Kyle Hunt of Massachusetts, on his website encourages people to disseminate the eggs to increase membership." Eggs of hate. Scrambles the brain, doesn't it? Don't you wonder if anybody opened one of these, read the message and thought, gee, what a great idea! Where can I join this fine organization? "A Jesus impersonator in Florida had his roadside Easter show interrupted by police who said that the bloody display was causing drivers to nearly crash their vehicles. An event organizer admitted that authorities said the display caused 'near accidents,' and 'that we're on public property, and we shouldn't be here.' 'There were a lot of close calls with accidents and traffic back ups,' he recalled the sheriff saying. "The nearly-naked man playing Jesus, whose makeup made him appear bloody and scarred, told the station that he climbed up on the cross because 'Easter is not about bunny rabbits.... This what our Christ endured for us. For our sins,' he said. 'And to hide that, is to not to live to the true faith of what he did for us.... It's just one of those necessities,' the actor added." Now if only Kyle Hunt could've gotten the bloody Jesus guy to scatter hateful Easter eggs, then all would be right in the universe.